For those of you on Instagram, you may have seen the recent buzz about a new quilt-along. 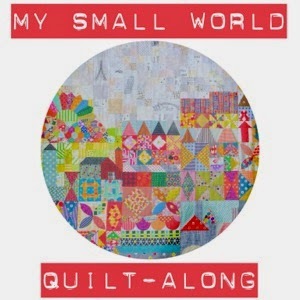 There are a team of us- John, Cindy, Megan, Danielle, Lisa and me hosting a quilt-along for Jen Kingwell's wonderful 'My Small World' quilt. The quilt-along doesn't kick off properly until May 18th but there are a lot of questions being posted so I thought it best to answer some here. This is the quilt we will all be making, it measures 33" x 52". It is the perfect scrappy project. I will be making mine from my stash including the tiniest of scraps. You can find it in the Quiltmania Spring Special 2015. There is no issue number as it is a special seasonal issue. 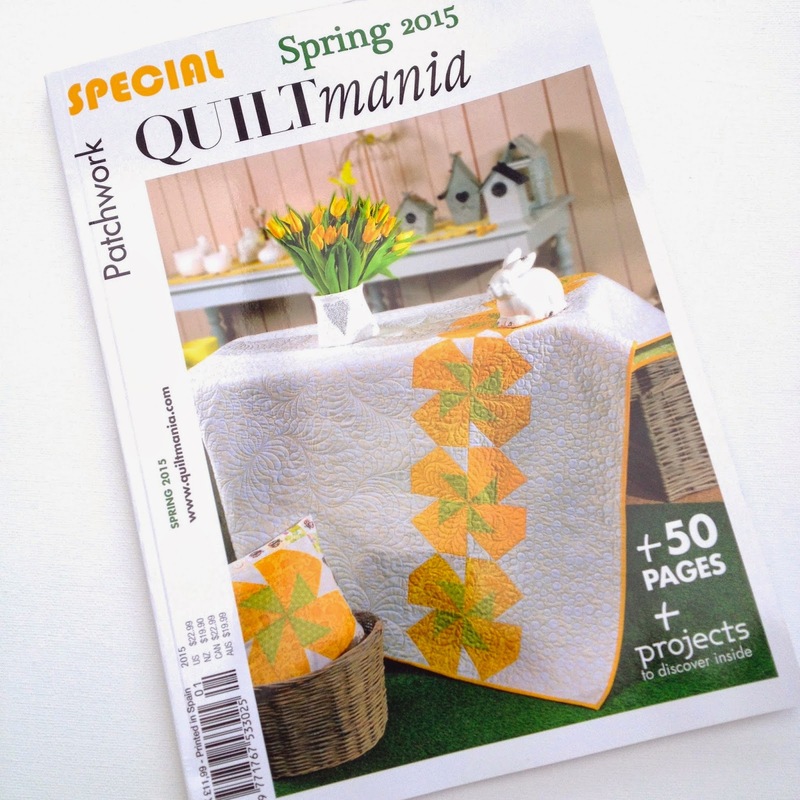 You can flick through the magazine at Quiltmania. I cannot find it for sale digitally as a single issue. Online at The Contented Cat. They will also send overseas- a possible option for European quilters. Online at Olive Grace Studios (the designer of the cover quilt). If you know of any stockists not mentioned, please let me know and I'll add them to the list. The quilt-along doesn't start May 18th to give participants a change to buy the magazine. The first post will be a general introduction about fabric choices and any planned changes like making a bigger quilt. The first construction post will not be until 25th May. As the pattern is in six parts there will be six construction posts with a different host leading each one, plus a final post near the end of September to wrap things up so the pace is going to be gentle. This is a detailed quilt which uses a lot of templates so not something to rush! It can be made by machine or by hand or a combination of the two. If you would like a button for your blog or other social media, here a range of sizes to choose from! Here is a larger 200 size blog button, scroll, copy and paste as before. Here is a supersize 300 version! Scroll and paste like before. If you haven't done a quilt-along before, think of it as a support group so that a group of people all over the world can make the same quilt in their own way and enjoy a bit of camaraderie, guidance and assistance where needed. You can decide your own fabrics and adaptations. It is not a beginner easy pattern, it does involve a lot of templates and a lot of the pieces are small but it should be relatively straightforward! Hopefully, we will inspire you and give you some tips on skills and techniques during the construction. We will not be giving lots of details and measurements from the pattern as you need to buy the Spring Special to take part but we will be sharing info on things like curved piecing, appliqué and alternatives, English Paper Piecing and much more. Jen Kingwell has given us her blessing and will be watching progress on Instagram. I'll be posting regularly here and have designated a blog page to store all the info. Much of the action will also take place on Instagram. The hashtag is #mysmallworldqal. The quilt-long hosts are @verykerryberry @liveacolorfullife @lucyandnorman, @j_q_adams, @vintagemodernquilts @petitselefants and you can tag us if you have anything to ask or show us. Thanks for putting this together. I'm excited to join and took a trip into my local town today and bought a copy from WH Smiths. It's going to be great to use up some scraps. Yaaaaaaay I am so happy this will be a QAL! I bought the pattern as soon as I saw it for the first time on IG so what better way to make sure it gets made (or at least started!!) in 2015 than to do it along with everyone else. Thanks for organising! I just bought a copy of the magazine from The Running Chicken. I'll be hand sewing what I can while I'm away in the van. Looking forward to seeing all the different ones and also some help! My copy has a typo in that part 1 pictures 8&9 are the same, so it would be helpful if that was pointed out to others. Omg .... I would love to join the group .... I ordered my copy online from www.sewnandquilted.com.au they are in Victoria Australia! So exciting ....and so much to do before the 18th! More material....more template plastic... New needles.... More material! I literally had my copy of the magazine opened to the quilt when your email post came in LOL! I am not sure if I will join the QAL as I have failed to keep up with any so far, but I do plan on making it one day for sure! Sold out of mags today,..more arriving at end of week....listed on website now. Quilters-paradise.com has them in California. I ordered mine from Primitive Gatherings but be aware that the postage to me, also in the US, was $9 and they don't disclose that when you buy. I also ordered from Primitive Gatherings and confirm they do not disclose how much shipping is when you purchase online. I was shocked that postage was $9. That really is outrageous for a mazagine. Just ordered mine (from a shop in the US) and can't wait to check it out. $30 is a lot for a quilt pattern but at least it can be made with scraps and stash! Yes thank you! We will be publicising this on the intro posts. will see if I can find the magazine. I'm going to enjoy watching these quilts grow! Hello Kerry, thank you for hosting the Quilt-Along. I won't be doing it (even thouh I love houses and am getting fond of very bright colours) but I just wanted to let you know that I wrote a message linking back to this post on a French quilters forum. Hope that's OK with you. Just found out about this via Instagram! I have the magazine and am almost finished my Gypsy Wife Blocks - perfect timing! I have just stumbled across this QAL and am so tempted to join in. Going off to find the magazine! I Just ordered the Issue today from Quiltmania. I am in Canada so I expect it will be some time before it arrives. I will be following the QAL on blogs and Instagram. Excited! 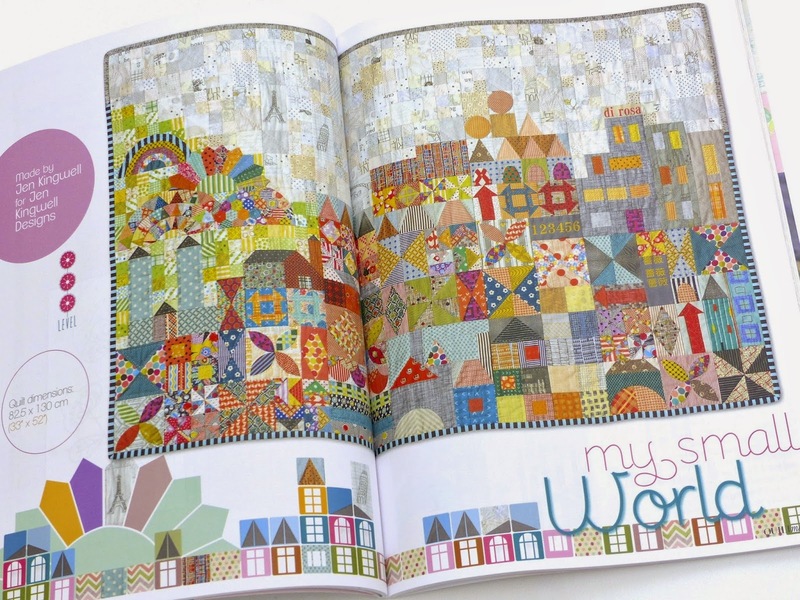 Hi, I just found the magazine at the web site of the designer of the cover quilt: http://olivegracestudios.bigcartel.com/ I'll be joining soon! So excited! Got a copy yesterday. We are lucky to have a local bookstore that has a great selection of quilting magazines. Found my copy at the forth place I checked. Already pulling fabric and cutting tiny squares! I do want to make it bigger and think the hot air balloons is a great idea. HI, I am working on Diagram 2. When I look at written instructions for cutting in inches such as the long dark pieces, the written instructions state " cut 2- 1 1/2" x 8 1/2" strips", but when I look at the drawing the measurements are reduced by 1/2 an inch. So things are not adding up, is anyone else having this issue? Or what am I doing wrong? The diagrams show the finished measurements so the seam allowances are not included like when a quilt block is described as 12" square finished and its unfinished size is 12 1/2". The written instructions are for cutting, the diagrams are for construction. I hope that helps. Thanks Anny for sending people my way!!!! No luck finding this anywhere! I just found a copy at the quilt shop in bath, uk. I don't remember if they had any other cooies. Hi Ruth, the magazine is no longer available but Jen Kingwell's pattern is now on sale from her Amitie shop in Australia, Fat Quarter Shop USA and elsewhere.